From the singing of Michael Cassius Dean of Virginia, Minnesota. Transcribed by Franz Rickaby about 1923. Then I shipped on board of the Ocean Queen, bound for Bellefresier’s shore. And forty-nine brass pounder guns she carried on her deck. With her main top Royal and stun sails set taking sixteen from the reel. It was eighteen inches to the man was all that there was to go. For a saying of our captain was that a dead man tells no tales. It was all in vain to ever try for to catch the Flying Cloud. Until a chain shot broke our mizzen mast and then we fell behind. When a bomb shell set our ship on fire, we were forced to surrender then. So youths beware of my sad fate and my curse on Piracy. “The Flying Cloud” lent its title to and was the first song printed in Michael Cassius Dean’s 1922 songster. It was also the longest song in Dean’s book at 16 stanzas and nearly 800 words. The song is a lament of an Irish lad from County Waterford who joined the crew of a ship bent on slaving and piracy and who is now in London’s Newgate prison facing the hangman’s noose. There are a number of audio recordings of other variants of “The Flying Cloud” including one from “Yankee” John Galusha who was born around the same time as Dean on the opposite side of the Adirondacks from Dean’s birthplace. 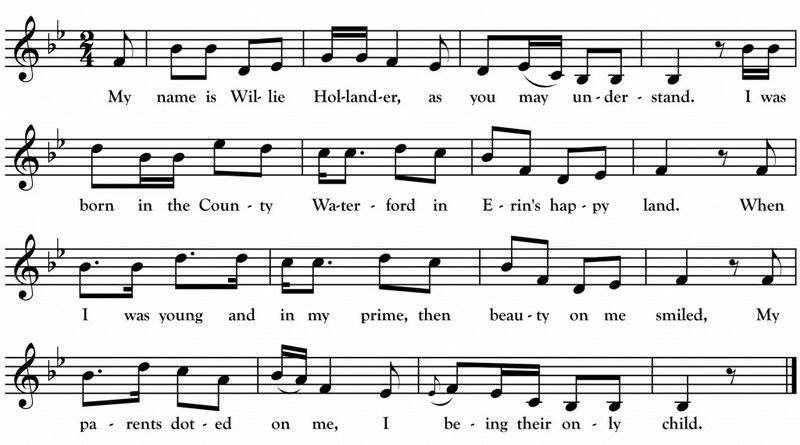 Sidney Robertson-Cowell recorded another version from Robert Walker in Crandon, Wisconsin. The airs used by Milloy, Galusha and Walker are all closely related to Dean’s. A very different and quite hauntingly beautiful air was recorded by MacEdward Leach in Newfoundland from singer John Molloy is worth listening to for anyone intrigued by this song.